Every move you make, every word you state, someone’s watching you. A subtle gesture, a grouchy attitude, or a curt response could alienate a potential or blossoming relationship. Sometimes we have the opportunity to correct our unpleasant gestures, while other times, someone will walk away with the wrong impression of us… forever. Kind of dramatic, but in this “small world” a person’s reputation can spread quickly. Break these 5 habits to avoid being unapproachable in your #business! So, what are the 5 elements that we should consider before approaching someone to ensure we aren’t sending the ‘wrong’ message? 1. Posture. If a silhouette can send a message, imagine someone who is slouching. Are they bored? Lazy? Tired? Hold your head up (Eye contact, remember?) and stand up straight. It says, I’m friendly, happy, and energetic. 2. Facial expression. A tilt of the head with a “what are you lookn’ at” expression is sure to keep anyone from sitting next to you. If you’re feeling sad, mad, frustrated, or just happen to have an “I don’t give a …” attitude, please stay home. A smile is all anyone wants to see when they’re mingling. 3. Attire & Grooming. If you look like you just rolled out of bed or like you haven’t seen a bar of soap in a few days, the chances are that you will not be approached. Is the old adage, “don’t judge a book by its cover” whirling around in your mind? While it is a wise and kind adage, it isn’t realistic in our society. Lack of effort in your personal appearance can be associated with lack of effort in your work or services. 4. Presence. Are you the loudest person in the room? Are you demanding and rude to the servers or host? Do you interrupt or talk over people? Do you walk around with an armful of business brochures shoving them at people? Is your disposition poised and pleasant or pushy and pompous? Are you sitting alone in a corner? 5. Distractions. In conversation or when roaming the room, are you the person shoving the complimentary appetizers into your mouth? Are you loaded down with three canvas bags filled with freebies? Are you obsessed with your phone or yourself (aka: selfies)? Are you smacking your gum? A distracting habit or careless manners takes the attention away from what’s important… you. Final thoughts: Your appearance and demeanor reflect how you feel about yourself and that tells others how they should feel about you. Are you presenting your best? If you aren’t making the impact you want, consider taking a closer look at what others might be seeing and make the necessary adjustments. 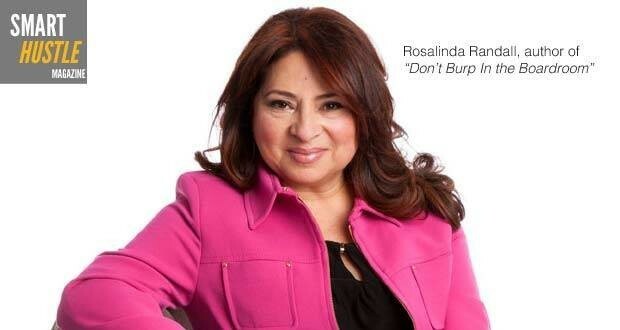 Rosalinda Randall is an Etiquette Consultant and author of “Don’t Burp in the Boardroom”. She believes that a little tact and humor is the foundation for better relationships. You can find Rosalinda online at www.rosalindarandall.com and follow her on Twitter at @rosalindatweets.